Massamba Diop (right) and Tony Vacca (left) perform during an assembly at Roger Ludlowe Middle School in Fairfield, Connecticut. Massamba Diop is the Senegalese drum soloist heard throughout the film. He recently visited the U.S. and met with middle school students in Connecticut to talk about his instrument, life in West Africa, and the making of "Black Panther." Seventh graders in Fairfield listened and watched carefully as the master drummer introduced them to his small, but fiery instrument called the talking drum. He cradled the small tunable drum under his left arm, then compressed and released its tension strings, while beating its head with a stick. 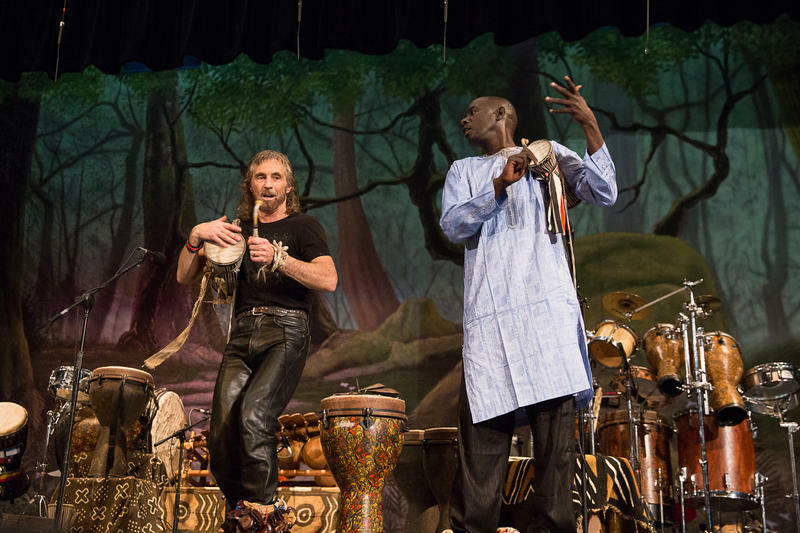 Diop performs around the globe as the lead drummer for Afro-pop superstar Baaba Maal. He’s also worked with musicians like Peter Gabriel, Herbie Hancock, and James Brown. 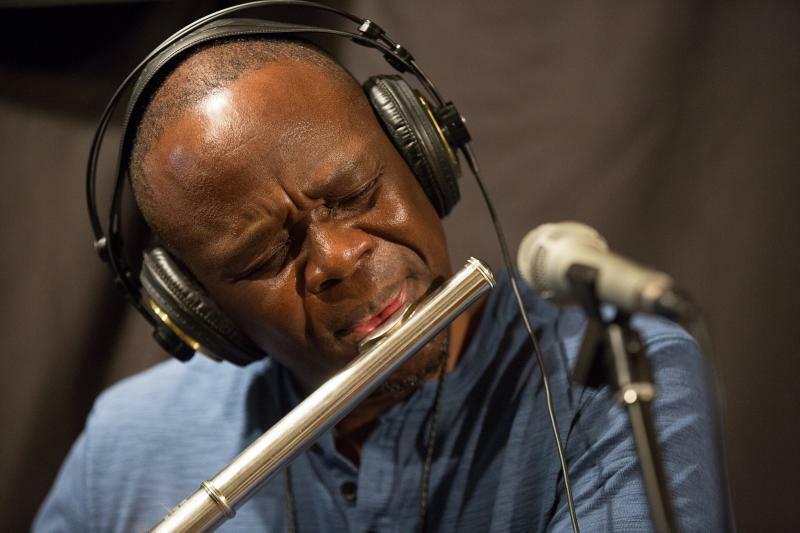 He was in Connecticut as part of the Senegal/America Project, which he co-founded more than a decade ago, using music as a vehicle to encourage cross-cultural understanding. Roger Ludlowe Middle School’s social studies program often brings in people to enhance the study of world cultures, and has worked with the Senegal/America Project for several years. They’ve even taken students to Africa. “The artists use the music as their vehicle. We at my school are trying to use the classroom as our vehicle to teach the kids about global citizenship”, said Richard Hahxi, who teaches geography and culture. This year, students are especially excited about studying Africa because many have heard Massamba Diop’s drumming featured on the score for the movie "Black Panther." After the classroom workshops, students were treated to a high energy concert in the school auditorium. Tony Vacca, U.S. co-founder of the Senegal/America Project, talked about performing with Diop. 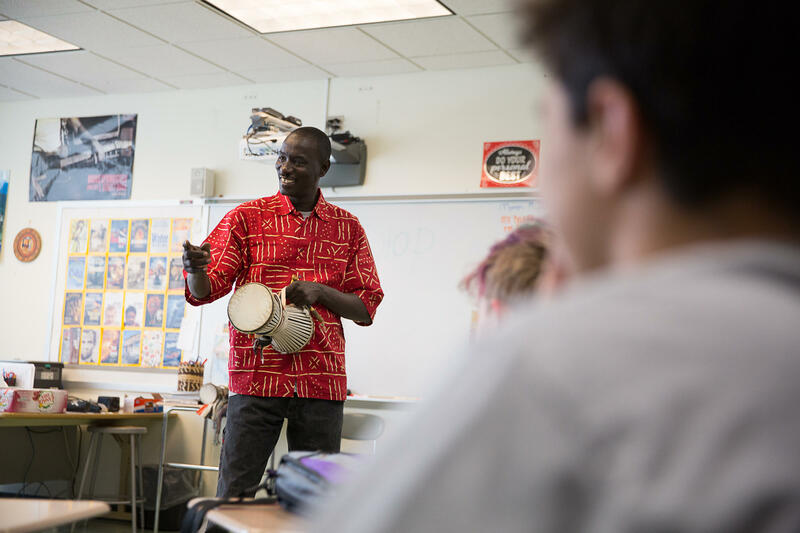 Holding one of his talking drums, Senegalese drum soloist Massamba Diop leads a classroom workshop at Roger Ludlowe Middle School in Fairfield, Connecticut on March 23, 2018. Later, Diop sat down to talk about recording the music for "Black Panther." He first met the film’s composer when Ludwig Goransson was in Senegal touring with singer Baaba Maal, researching the sounds and rhythms of Africa to weave into his compositions. Maal’s voice can be heard soaring over the hilltops in the film, as the main character T’Challa enters the mythical African nation of Wakanda. While in Senegal, Goransson asked Diop to improvise around the name of the main character and around action scenes in the film. Later, he flew Diop out to California to record. And Diop is certainly here. He’s already been signed for the next "Black Panther" film. At the same time, he says he’ll keep sharing the message of his talking drum with schoolkids, which he says calls on all people to just keep talking.